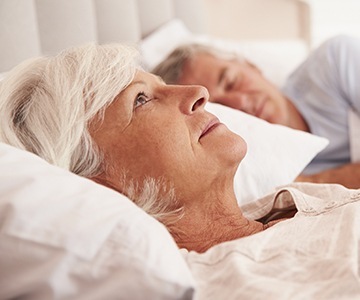 At our practice, Dr. Robert Dernick and our team are dedicated to helping the people of The Woodlands overcome one of the most common sleep disorders in the world, sleep apnea. It is estimated that over 18 million people currently suffer from it in the U.S. alone, and that number is only growing with each passing year. What is sleep apnea? In short, it is a condition where a person experiences brief lapses in breathing while they are asleep. This causes the body to go into emergency mode and partially wake up in order to restore proper breathing. This can happen hundreds of times a night, and it prevents a person from getting the deep, restful sleep they need to feel awake and energized during the day. These cessations in breathing can be caused by a few different factors. The most common involves the soft tissues in the mouth and throat (including the tongue) relaxing and collapsing into the airway, blocking it. This is called obstructive sleep apnea (OSA), and this is primarily what our practice treats. Central sleep apnea (CSA) is a neurological condition where the brain stops sending the body the signal to breathe while asleep. And, there is also complex sleep apnea, which is a combination of the two. Fortunately, as prevalent as sleep apnea is (particularly OSA), it is a very treatable condition. 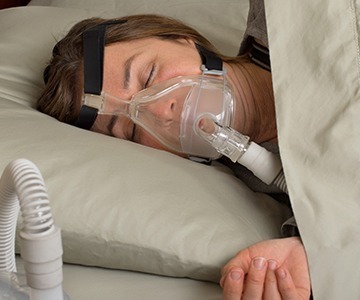 The most commonly prescribed treatment is CPAP therapy, in which a patient wears a mask to bed that is connected to an air pump that forces air into the throat in order to keep it clear. As you can imagine, many patients find this quite uncomfortable, and some are even CPAP intolerant. There is a viable alternative, however, that more and more doctors are now recommending: oral appliance therapy. Oral appliance therapy uses a custom-made mouthguard to gently shift the jaw in order to keep the airway open. Dr. Dernick can provide this kind of appliance for our patients, and thanks to his dental acumen and years of sleep apnea experience, he’s able to make sure they both fit comfortably and relieve a patient of their symptoms at the same time. However, in order to receive any treatment, a patient must first obtain a proper diagnosis. We can help you quickly start this process by taking our STOP-BANG Assessment. It is only 8 “Yes or No” questions, and it will reveal your likelihood of having sleep apnea. It only takes a minute to complete, and after you have submitted it, Dr. Dernick or a member of our team will contact you within 24 hours with advice on what you should do next. We’ll be with you every step of the way to make sure you get exactly what you need. 1. Generally, sleep doctors believe that average healthy adults should only need about 7-9 hours of sleep each night to feel well rested during the day. 2. Sleep apnea can make it more difficult to lose weight as well as keep it off. 3. Chronic sleep deprivation can cause memory problems because it prevents the brain from being able to properly organize information at the end of the day. 4. Many people who suffer from sleep apnea mistakenly believe they are insomniacs because the breathing cessations cause them to wake often. 5. Snoring is one of the most common signs of sleep apnea, but not all people who snore have the condition. However, those who do consistently snore are more likely to develop a sleep disorder in the future. 6. It has been shown in multiple studies that driving while drowsy is actually more dangerous than driving while drunk. 7. Up to 80% of all people with sleep apnea are either undiagnosed or misdiagnosed. 8. If you frequently wake up in the middle of the night to go to the bathroom, it could actually be a sign of sleep apnea. Many apnea patients are unaware that they are actually being woken up by a stoppage in breathing. 9. Nighttime teeth grinding, AKA bruxism, may also indicate sleep apnea as well. 10. A larger than average neck or tongue can also cause a person to have sleep apnea symptoms. Snoring is one of the most common signs that a person has sleep apnea, but not everyone who snores necessarily has the disorder. While sleep apnea refers to a complete blockage of the airway, snoring actually occurs due to a partial blockage. As air passes through the throat, it causes the tissues in the mouth and throat to vibrate, creating the sound we’re all familiar with. While it may be easy to simply categorize snoring as a simple annoyance, it can still indicate that a person isn’t getting the quality of sleep that they need. Also, people who snore are more likely to develop a sleep disorder in the future. Snoring treatment is available at our practice to help both patients and their bed partners sleep better here in The Woodlands. This usually comes in the form of an oral appliance, one that is very similar to those Dr. Dernick uses to treat sleep apnea. If chronic snoring is a problem for you, just give our office a call, and we’ll be happy to help. As we touched on above, CPAP therapy is currently the most prescribed treatment for sleep apnea. However, research has shown that as many as 50% of the people with CPAP machines never use them. Why is this the case? In short, it is because the machine often creates as many problems as it solves. The air pump itself can be quite loud, which can be disturbing for both a patient as well as anyone who sleeps near them (even in another room). Many patients also feel very uncomfortable and even claustrophobic because of the full facemask they have to wear. The machine is also very difficult to travel with, so many patients simply leave it at home. In lieu of all this, CPAP therapy is still very helpful for millions of people around the country. However, oral appliance therapy does offer a less invasive and more convenient alternative for many. Oral appliances are small, quiet, and easy to pack, making them an overall more comfortable option for many patients. If you have been prescribed a CPAP machine and would be interested in seeing if oral appliance therapy would work for you, we’re happy to help you explore your options. To schedule a consultation, simply contact us today. Is Oral Appliance Therapy Covered by Insurance? Even though oral appliance therapy is provided by a dentist, it is often covered by a patient’s medical insurance as opposed to their dental insurance. This is because the treatment is addressing a medical problem, not a dental one. Thankfully, our insurance coordinator, Stacey, knows all about this! She can help you figure out the best way to use your plan in order to save on your care. We happily accept virtually all insurance plans, including Medicare. She’ll work with you to make sure your treatment fits easily into your budget. If you have questions about how we can help you get a better night’s sleep, fill out this short form and we’ll be in touch.